Name, Office And Aims And Objectives of the SIETK, Women Empowerment Cell is set out fully in the Memorandum of Cell. A faculty member shall be an individual lady faculty subscribing with a sum of Rs.50/- at a time. A Non Teaching staff member shall be an individual lady staff subscribing with a sum of Rs.50/- at a time. 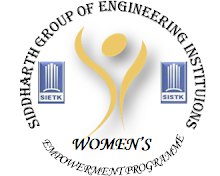 Any person, who is women student of ‘SIDDHARTH INSTITUTE OF ENGINEERING AND TECHNOLOGY, PUTTUR is eligible to become an student member of the Cell by paying a subscription fee of Rs.10/- on semester basis. A member enrolled at any time of the year shall pay full subscription for the semester irrespective of the date of enrollment. Subscription fee is valid for the semester in which they are enrolled. Any member may resign from the membership of the Cell at any time by written notice to the secretary of the Cell after paying all the subscription dues and the membership shall terminate on acceptance of the resignations by the executive committee. Any member can be expelled for such conduct at an extraordinary Executive committee meeting with the required quorum. To exercise general control over the affairs of the Cell and give guidance to it. To pass the annual report and audited accounts of the Cell for the publication. To pass the annual budget of the Cell. Generally to do all works relating to the affairs of the Cell not otherwise provided for. b. The Executive committee shall be empowered to appoint subcommittee committees for specific purposed of activities of the Cell. The society shall be competent to raise funds for its working in one or all of the following ways. Contribution from members and for the implementation of the activities. The Funds shall be spent only for the attainment of the objects of the Cell only no portion there shall be paid or transferred directly or indirectly to any of its members through any means. a. The Executive committee shall meet as and when necessary but shall meet at least twice a year, and meeting of the Executive committee shall be presided over by the president. In his absence the members shall choose one amongst from the present to preside over the meeting. b. All questions at any meetings of the Cell shall be determine as for as possible unanimously or by a majority of votes, every member of Executive committee shall have one vote, in case of an equality of votes, the president of the meeting shall have a casting vote in addition of his ordinary vote. c. Every notice calling a meeting of the Executive committee shall indicate the date, time and place at which such meeting will held and before the day appointed for such meeting. To preside over the meeting of the Executive committee. To raise the necessary finances and exercise full control and supervision over finances and administration of the Cell. To supervise the activities of the Cell. To appoint, dismiss or suspend staff members of the Cell with the recommendation of Executive committee. Control direct and supervise all activities and do all acts are necessary for effective implementation. Deal with cash, accounts, records and documents of “SIETK, Women Empowerment Cell”. Can appoint officer for the smooth function of the society on permanent or temporary basis. The president may appoint sub-committee as deems fit for implementation of the activities. The Secretary shall have full authority to carry on the general day to day administration of the “SIETK, Women Empowerment Cell” carry out of all the policies, plans and programs of work initiated, laid down or approved by the Executive committee. Carry on correspondence on behalf of “SIETK, Women Empowerment Cell” and empower any one to do so. Generally carry out of all such things as the Executive committee may decide. The joint secretary in all aspects co-operates with the Secretary in connection with the welfare of the Cell, and takes charge in the absence of secretary. All the Members shall assist to the president and secretary of the Cell in day to day work. Sub-committee for such purposes and with such powers as the Executive committee may think fit. In case the Cell decides to wind up its activities then the properties and funds of the Cell that will remain after full satisfaction of the liabilities of the Cell will be transferred or or paid to institution. CERTIFIED that this is a correct copy of the Rules and Regulations of “SIETK Women Empowerment Cell”, which is certified by the persons of the Executive Committee.